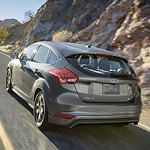 The Ford Focus has been a leader among compact cars for a number of years. Its sleek, sporty design is one of the reasons for this. The Focus is a great choice for those that want a sports car look in a compact sized vehicle. Find out how the new Focus has incorporated the latest in modern styling trends. The exterior of the Focus immediately draws your eye. For example, the new Focus ST comes complete with a low valance due to molding on the rocker area. This gives the vehicle a high performance profile. The ST also has colored center-exit exhaust to complement the body color. As a final touch, a rear spoiler shows that the ST is ready to perform on the road. Even the Ford Focus Electric dons an attractive exterior. It has unique styling for the front grille, and a variety of bright paint color options. You don't have to feel like your styling options are limited when you choose a Focus Electric. Get to Bergey's Ford of Ambler today to test drive a new Ford Focus of your choice.